The Villa Saint Joseph-du-Lac Foundation is a registered charitable organization providing funding to enhance resident care at Villa Saint Joseph-du-Lac. We rely on the generosity of others to help us continue to provide the expert and loving care that benefit so many. Since its inception and through the generosity of the community, the Foundation has helped to fund the purchase of our 15 passenger bus which is utilized by our residents for outings, recreation equipment and other items which are not funded for by the Department of Health. The Villa Saint Joseph-du-Lac Foundation is governed by a voluntary board of directors with representation from the community and Villa management. Funds are raised through gifts, special events and other fundraising activities. A gift to remember someone special is a thoughtful gesture to the family and a meaningful contribution to better healthcare in your community. We send the family a beautiful cared to notify them of your gift. The amount of gifts is kept confidential. You will receive a letter and tax receipt for you donation. What a great idea – commemorate a special birthday, anniversary, retirement or appreciation. When you give a gift for a special occasion, we send a special card to the person being honored. The amount of your donation is kept confidential. You will receive a letter and tax receipt for your gift. There are many ways to give. For some, it is leaving a legacy to support the things they care about most. For others, it’s also an important part of their financial planning. Whatever your reasons, creating a planned gift for the Villa Saint Joseph-du-Lac Foundation provides vital funding for equipment purchases and other non funded items. Wills and Bequests – You may wish to name the Villa as a benefactor your will. Cash – Gifts of cash are the most common and often easiest to donate. Checks should be made payable to: Villa Saint Joseph-du-Lac Foundation. Securities – Gifts of appreciated stocks, bonds, or mutual funds can provide special tax advantages. Endowments – This is a transfer of money or property donated to the Villa with the stipulation that it be invested, and the principal remain intact in perpetuity or for a defined time period. This allows for the donation to have a much greater impact over a long period of time. Life Insurance – You may name Villa Saint Joseph-du-Lac as beneficiary of a life insurance policy. Annuities - any recurring periodic series of payments. RRSP’s and RRIF’s – These may be donated with some tax advantages. Property – Gifts of homes, farms, and other real property can received the same tax treatment as gifts of appreciated securities. A planned gift is an important decision that requires thoughtful preparation Family and financial advisors are often involved. Timing and taxes need to be considered. If you have questions about the type of gift you should create or anything else related to gift planning, we can help. Our administrative staff is happy to work with you, your family and your advisors on a confidential basis to ensure all your goals are meet. Please contact us. Three participants in the tournament were selected in a random draw for the opportunity to win a million dollars if they scored a hole in one. The ceremonial cheque is held by Julien Muise, Villa Director of Rehabilitation Services, Phil Mooney, Foundation President, Helene D'Eon, Villa Administrative Assistant and, Jason Ellis representing Murray Dodge. 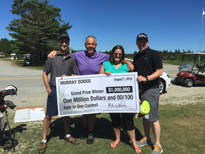 These lucky participants won the opportunity to sink a "Hole in One" for One Million Dollars. 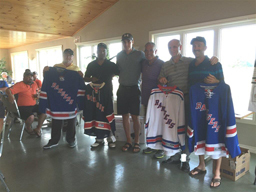 None were successful but they received consolation prizes of autographed New York Ranger jerseys from Ranger draft choice and tournament host, Ryan Graves. Louis Bonnanfant , participant in the 2nd annual Villa Saint-Joseph du Lac golf tournament, was the lucky winner of the autographed hockey stick donated by tournament host and New York Ranger draft choice, Ryan Graves of Yarmouth.